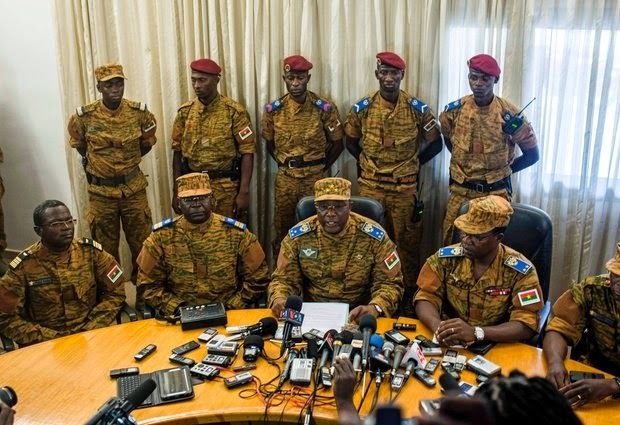 OUAGADOUGOU, BURKINA FASO (AP) — The president of Burkina Faso stepped down Friday after protesters stormed parliament and set the building ablaze, ending the 27-year reign of one of Africa's longest-serving rulers who had survived previous attempts to topple him. An army general quickly stepped into the vacuum left by departing President Blaise Compaore. Gen. Honore Traore, the joint chief of staff, told a packed room of reporters that he would assume the presidency until elections were called. When he resigned, Compaore had said a vote would be held in 90 days, but Zida said the "length and makeup of the transitional body will be decided later." Over the course of several dramatic hours, Compaore went from looking likely to jam through parliament a bill that would let him seek a fifth term to agreeing to step down next year to abandoning office immediately. But French President Francois Hollande was quick to "salute" his decision to resign. While he was respected on the international stage, critics noted that, under Compaore's semi-authoritarian rule, the country of 18 million people remained mired in poverty. The landlocked country's fortunes rise and fall with gold and cotton prices — and adequate rain in a region plagued by drought. Compaore's exit will have significance throughout the region, where many leaders have pushed through constitutional changes to prolong their rule and others are attempting to, said Africa expert Philippe Hugon. "It's obvious that what happened will have an echo in other countries," said Hugon of the Institute for Strategic and International Relations. In the end, Compaore was pushed from power by violent protests and an emboldened opposition that would accept nothing short of his resignation. Opposition protesters gathered in a square in the capital on Friday and burst into cheers when they heard the announcement of his resignation on hand-held radios. "I declare that I'm leaving power," Compaore said in a statement. "For my part, I think I have fulfilled my duty." Compaore, 63, was headed south to the city of Po, near the border with Ghana, a French diplomatic official said on condition of anonymity, citing the sensitivity of the situation. The outgoing president was still in Burkina Faso on Friday afternoon, and it was not clear if he was trying to cross the border, the official said. He had not asked the French, who were once the country's colonial rulers, for any help. Images of flames enveloping the legislature, cars burning in the streets and protesters massing in the capital raised the specter of a long standoff. But events moved swiftly, with the government suspending the vote and the military announcing that the legislature had been dissolved and an interim government would be formed. After that, Compaore said he would lead until the new elections. Protesters rejected that plan and gathered again Friday, demanding that Compaore step down immediately. It was a sharp about-face for a ruler who had survived other attempts to overthrow his regime. Compaore first came to power following the October 1987 coup against then-President Thomas Sankara, Compaore's longtime friend and political ally who was killed in the power grab. For many, his legacy begins and ends with the death of Sankara, a well-regarded statesman whose death was widely viewed as a setback for the entire continent. More recently, he has refashioned himself as an elder statesman who brokered electoral disputes and hostage releases throughout West Africa. Domestically, he kept a tight leash on any opposition, never groomed a viable political heir and fought off threats to his power. In 2011, waves of protests washed over Burkina Faso, challenging Compaore's rule, and mutinous soldiers occupied the palace at one point, forcing the president to flee. But what would have spelled the end for many presidents was a temporary problem for Compaore. He maneuvered to stay in power by removing his security chiefs and appointing himself defense minister before returning to Ouagadougou. Associated Press writers Sylvie Corbet and Elaine Ganley in Paris contributed to this report.